Imagine if going to school meant more than preparing kids for a test, teaching a canned curriculum, and training students for their future as workers. What if school were also about cultivating students to be caring, community-involved citizens and critical, creative thinkers who love to read? In Caring Hearts & Critical Minds, teacher-author Steven Wolk shows teachers how to help students become better readers as well as better people. "I want [my students] to be thinkers and have rich conversations regarding critical issues in the text and be able to formulate opinions regarding these issues," says Leslie Rector, a sixth-grade teacher who collaborated with Wolk on some of the units featured in this book. Wolk demonstrates how to integrate inquiry learning, exciting and contemporary literature, and teaching for social responsibility across the curriculum. He takes teachers step-by-step through the process of designing an inquiry-based literature unit and then provides five full units used in real middle-grade classrooms. 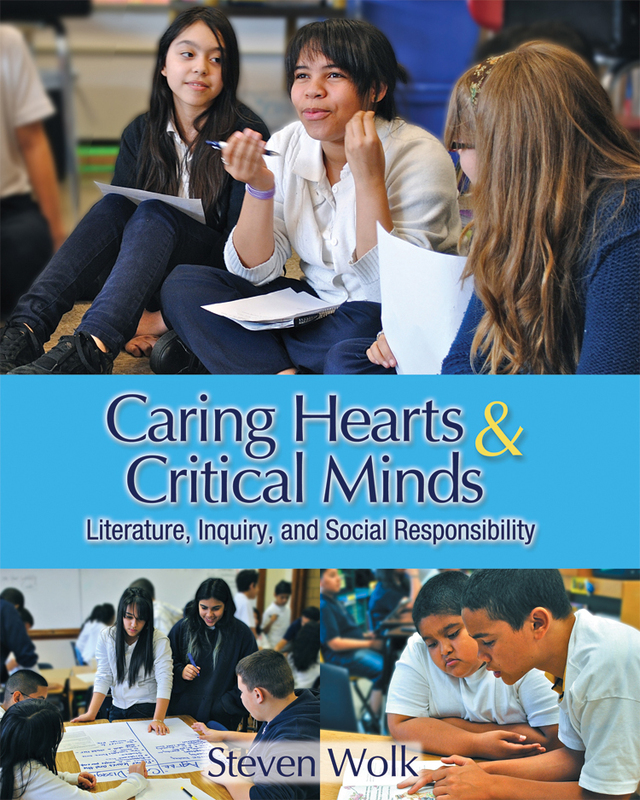 Featuring a remarkable range of recommended resources and hundreds of novels from across the literary genres, Caring Hearts & Critical Minds gives teachers a blueprint for creating dynamic units with rigorous lessons about topics kids care about—from media and the environment to personal happiness and global poverty. Wolk shows teachers how to find stimulating, real-world "complex texts" called for in the Common Core State Standards and integrate them into literature units. "I know from experience that a great book changes the reader," says Karen Tellez, an eighth-grade teacher featured in the book. “For me, books have helped me escape, fall in love, recover from heartbreak, and have broken open my mind from the age of twelve. . . . I hope [my students] gain better reading comprehension, confidence as readers, connections to the characters and events, a curiosity for the world, and tolerance for others." Caring Hearts & Critical Minds shows teachers how to turn these hopes and goals into reality. As a kid growing up in suburban Chicago, Steven Wolk loved the Cubs and hated to read. When he graduated from high school, he could count all of the novels he had read on one finger. Really, one finger. Chapter 7: Does Technology Always Make Life Better? Chapter 8: Why Should I Care About the Environment? Chapter 9: What is Empathy? Chapter 10: Why Should I Care About What Is Happening Around the World? Chapter 11: Why Care About Poverty?